There are two ways to fight for the environmental causes you believe in. You can read the news to keep yourself privy to ecological happenings, write strong-worded letters to your representatives, and finally vote with crossed fingers for the public official who represents you best. That's option one. Option two: Use mind-controlling pheromones and toxic flora to persuade and poison your way to eco-justice! 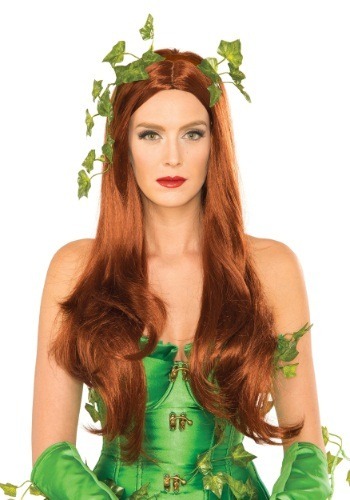 With this Kanekalon fiber Poison Ivy wig on your head, option two becomes a bit closer to a real possibility. Another possibility: you can flaunt your crimson locks like the infamous DC villainess while hunting down the Dark Knight in Gotham or at the next costume party. Note: mind-controlling pheromones, exotic plants, and potent toxins are, unfortunately, all sold separately. The wig is great! I only gave it 4 stars because the picture has a leave headband and it is not included.